Why Hong Kong Needs English Teachers! In the upcoming months, I’ll be going into a bit more detail and helping you out in terms of how to get a job as an English teacher in Hong Kong, amongst other countries (such as Taiwan and South Korea). To start with though I have to say Hong Kong seriously needs Native English teachers and for a number of reasons. Here are my top five reasons why Hong Kong needs English teachers – well, native ones. It is known that a lot of native English teachers move to Hong Kong and work for a year or two and then leave. There is a high turnover of staff and therefore a constant need for new English teachers to replace the ones that have come and gone. I will detail this a lot more in future but basically you normally get a one year contract, after which the option to renew comes up. 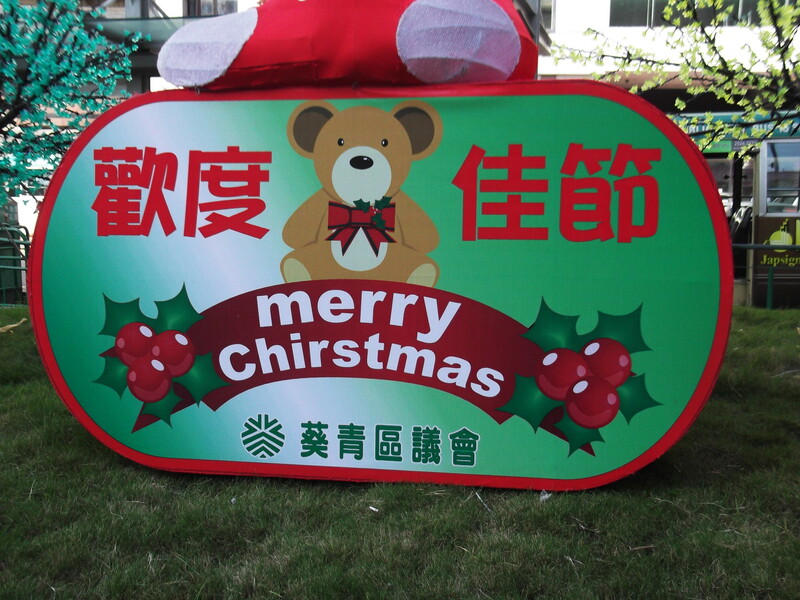 The bad English stretches from speech to spelling and writing, as you can see from this posts first photo, just a few days ago in Hong Kong I came across a sign saying “Merry Chirstmas” and the below photo taken today from a Christmas Card I received. 3. Philippeno and Indonesian Maids! You might be wondering what this has to do with Hong Kong English but it’s become glaringly obvious to me that the (difficult to understand, culture wise) Philippeno and Indonesian Maid culture here that is widespread has a very bad effect on Hong Kong children’s learning of English. First of all, families and couples in Hong Kong lead busy lives and they really really believe that their work is the most important thing in their day (honestly! – in stark contrast to me – Working Wednesdays – Travel Writing. ) As a result, they have less free time to themselves (through a major fault of their own I have to add) and they often pay for a maid! Ridiculous as it sounds, this is true in Hong Kong. The majority of these maids are from Indonesia and the Philippines and they work for a low price. In addition they get free food and accomodation as well as a temporary Hong Kong ID card and valid working visa! They often have to look after the children in these families, taking them to school, changing them and bringing them home from school and even doing homework with them. Hong Kong is a global metropolis and business hub. It’s marketed as Asia’s World City and it’s skyscraping skyline is jammed full of office tower blocks. In order for Hong Kong and China to connect to the rest of the world in a business sense, what else would they need? Yes, of course a good grasp of the English language! Last on this list but not least, Hong Kong’s history will tell it that learning English is a good thing. Once a British colony, and used for world trade, one of the major reasons for the wealth and development of “The Kong” was the ability to trade. Trading with places like England, Australia, Canada and USA. If it worked before and it works now, why change it? By default English should be a certain language for all business people in Hong Kong to know. It’s a city that wants to maintain the successful city culture that its history clearly shows. More posts to follow in future on teaching English in Hong Kong. This entry was posted in Asia, Destinations, Destinations, Hong Kong, Jobs, Lists, Teaching English. Bookmark the permalink. Great post ! I have never been to Hong Kong but would love to one day. English is not my native language either but I have my blog in English to practice more. First of all this is a cracking blog so informative about anywhere. My girlfriend and I are thinking of heading to HK on a working holiday visa. Im from n.i. So same as yourself able to have British and Irish passports. With the Irish one I noticed there is a 3 month restriction with each employer but British is 12 months with employer. In regards to teaching English would it be better to be on the British one as no restrictions. Irish visa is free though ha. Did you teach English yourself? How was the money with bar work? Any info hugely appreciated mate.